Esterbrook was one of the largest fountain pen producers in the US, founded in 1858. They produced an inexpensive but remarkably high quality pen. Walter Sheaffer used to challenge his new salesmen during their training classes about how to convince the retailer to buy Sheaffer pens rather than Esterbrook pens, when the Esterbrooks were a lower cost investment for his shop, and just as good as the Sheaffer pens for his customers. The Esterbrook Pen Company was dissolved quite a few years ago in 1947. Nevertheless, Esterbrook fountain pens are still popular today because the nibs are so easy to change and there are so many to select from. 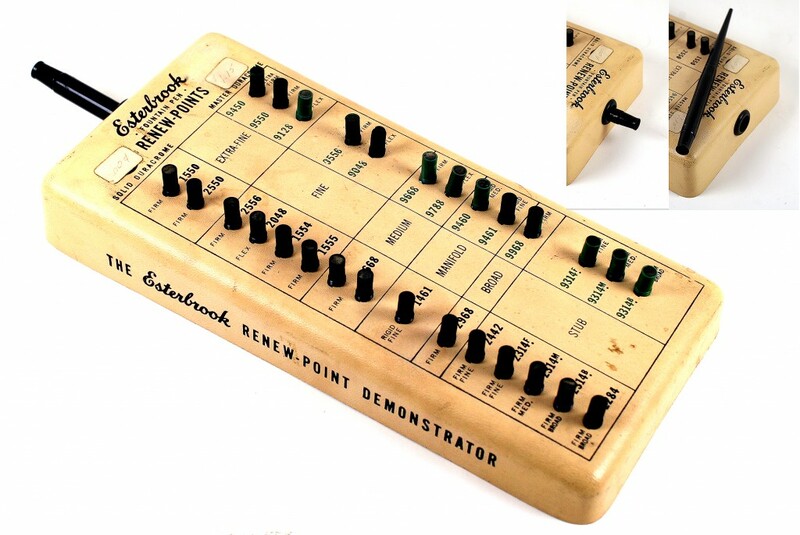 Although other companies also produced nib units that could be changed, the Esterbrook units were among the most user-friendly. This entry was posted in Vintage Pens and tagged Ads, Esterbrook, Fountain Pens, Go Pens, GoPens, Vintage Fountain Pen, Vintage Fountain Pens, Vintage Pen, Vintage Pens. Bookmark the permalink. Follow any comments here with the RSS feed for this post. Post a comment or leave a trackback: Trackback URL.